Ever since I wrote The TCP/IP Guide, fans of the material have been asking me if it was available in book form. Now, after a year and half of hard work by both myself and publisher No Starch Press, I can finally say, yes! The book is called, naturally, The TCP/IP Guide. 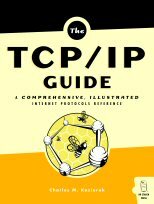 It is a hardcover, professionally bound book that is 1,616 pages in length and includes the same basic content as version 3.0 of the electronic edition of The TCP/IP Guide. It has the same text and diagrams (in black and white) and adds a full index. The book is being distributed through normal commercial channels and should be available through most online and brick and mortar book stores. The list price of the book $99.95 in the United States, but it is available for much lower prices at many online discounters. For example, it is currently around $60 at Amazon.com. For many years I also sold the book directly, but due to dwindling sales, my inability to compete price-wise with sites like Amazon, and the time commitment required to manually process orders and ship books, I have discontinued this service. Thanks to everyone for their past support.